Maxi dresses, can maxi out my credit cards!!! I have to be honest here, I go through my moments where I just wear trousers or maxi skirts or sweats, depending on my mood and weight. My new thing and trend is maxi dresses. I’m going crazy trying to find the perfect maxi dress and i’m on the hunt for more then one! I have been looking for a few months now. I can’t find the right fabric or the right print or cut, something is always wrong. When I do find the perfect maxi dress, then the ultimate disappointment, it cost way to much. And yes I know and I’ve heard the common, ‘if you’re going to wear it a lot and make good use of it, then you should just spend the money’. Well, I don’t really have this kind of money! lol. I just wanted a few perfect dresses for the summer, ramadan, for my perfect Eid with my wonderful family in Vancouver and the amazing destination wedding that we will be attending in Mexico for my sister in law. I just need more then ONE! Here are my two favorite, Ralph Lauren with his Bohemian dream dress!!! I’m so in love with this dress, the floral print, the way it flows, it looks so dark and goth but so girlie!!! I WANT IT SO BADLY! And the second one is by Dior and I just love the cascading ruffles, I’m not in love with the deep neckline but I could work with that. So there it is, my two fav’s and I can’t afford neither of them! But I wouldn’t spend that much unless I was loaded. But who knows if I would even then? I’ve gone to the mall so many times and my to favorite stores and I’ve really found nothing that appealed to me. I’ve left with one simple blue maxi in a jersey knit fabric from Forever 21. This just goes to show that I have to make my own frocks and you lovely ladies will see versions of maxi dresses i’ll be selling in my line Insha’Allah. 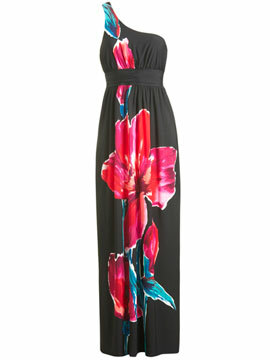 I’m in love with this floral print maxi dress. If I were to alter this dress, I would make it a high neck and add sleeves down to the wrist. It’s a gorgeous maxi dress and it would look lovely with a light cotton hijab in any one of these colors> pink, blue, white, green or even yellow. For $49 you can’t go wrong! (Bad news, I went to the website to purchase the dress and it was sold out. I waited to long!) You can get many other maxi styles at Arden B.com, they are having a great sale. Act quickly, they are selling fast!!! All you have to do with these dresses is add a long sleeve under shirt and some accessories. Stay tuned for a quick tip tomorrow!! !